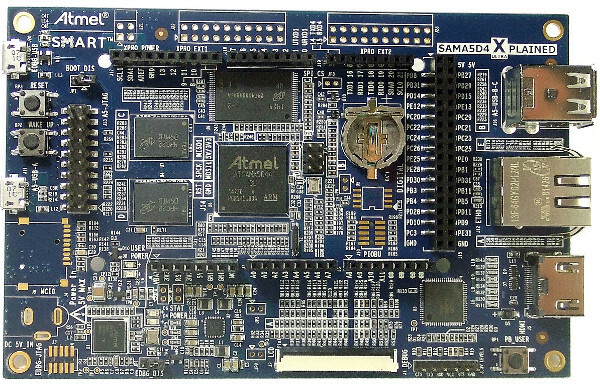 The SAMA5D4-XULT evaluation kit is a full-featured evaluation platform for the SAMA5D4 series ARM®-based microprocessor units (MPU). It allows you to extensively evaluate, prototype and create application-specific designs. This evalutaion is based on the integration of an ARM Cortex®-A5-based microprocessor with external memory, one ethernet physical layer transceiver, two SD/MMC interfaces, two Host USB ports and one Device USB port, one 24-bit RGB LCD and HDMI interface and debug interfaces.Seven headers, compatible with Arduino R3 (Uno, Due) and two Xplained headers are available for various shield connections.